Each year the Local Sports Council provides the sporting community with the opportunity to nominate their coach for VOLUNTEER COACH OF THE YEAR. This award is made to those Voluntary coaches who local sport relies upon to recognise their involvement during the year. Nominations should be made for coaches who have been committed to providing the highest standard of coaching to their performers, whether it be with individuals or teams. They should have made a significant impact in their sport, helped other coaches to develop and have a positive and encouraging role model attitude that has inspired and made an impact on others. Volunteer coaches are a very important part of all sport with countless people giving up their time and experience to assist others. Basingstoke has a wealth of such people with six excellent nominations this year. All other coaches should all applauded for the contribution to local sport. 2016 & 2017 Ian Cameron & Keone Crockwell (Swimming), 2015 Russell Amos (Rugby), 2014 Marcel Mavronicholas (Basketball), 2013 John Davis (Athletics), 2012 Colin King (Canoeing) 2011 Katherine White (Karate) 2010 Gerry Reilly (Taekwondo), 2009 Andy Compton (Bison U.14 Ice Hockey), 2008 Jonty Spaul (Overton RFC), 2007 Billy Jewers (Basingstoke & MH Athletics), 2006 Mike Tucker (Basingstoke & MH Athletics), No Award in 2003/4/5, 2002 Gary Millar (Overton RFC), 2001 Chris Berry (Basingstoke & MH Athletics), 2000 Anna Fearnley (Storm Netball) & 1999 Graham Watt (Bison Ice Hockey). Ryan is Head Coach to the Basingstoke Junior Development Teams and is a true leader. He is totally dedicated to coaching the junior teams and can stay on the ice all evening coaching the U9s through to the U15s. He also steps in to coach the U18s if their coach is away. He is qualified to level 2 and is always looking for new techniques for developing the kids. He is always bringing in new training aids which he funds himself. In 2018, he coached the U15 team last season and gained them promotion to South League 2. He has two sons who play hockey and he will sometimes miss their games if a team need a coach for an away game, he always steps in where needed even if it does not involve his children. Toby is coach to the Junior Jiu Jitsu team whom he has helped coach to many gold medals and also the team trophy at the Bournemouth open in 2018. Toby regularly gives his free weekend time to go and support, and coach, the junior team at competitions and his impact on the club has been massive. The junior classes are expanding but with Toby in the class it can be split in certain areas so the kids get the best instruction possible.Toby is always very energetic and happy when coaching and always conducts himself in a professional but fun manner. He is very popular with parents because he is always chatty and personable. Rafer took up coaching after a successful athletic career. He still competes and holds his own at club level. He is thus an inspiration to younger members of the club. After competing at a high level Rafer has acquired a vast knowledge of the technical events and In order to improve his knowledge he also qualified as a sports masseur. Rafer’s athletes compete both in club matches and regional/national events. 2018 highlights for Rafer are coaching an athlete to become u20 National Champion Decathlete and UK u20 National Indoor Champion Decathlete, He supports many athletes at Schools Championships and coaches daily to members of his group, and even runs coaching camps in France. Dave continually develops in his coaching role at BMHAC by reading all the latest publications and following the top athletes in the world. He communicates well with other coaches across the club and departs his knowledge on them as well as learning from them too. As a competing athlete himself, he uses the knowledge he gains each time he runs. Highlights for 2018, include coaching an athlete to no. 1 in u17 400m, a county u11 girl champion and creating a development pathway from u11 to adult. 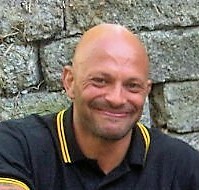 Many of the athletes Dave coached achieved a top 50 ranking in the UK. In 2018, Georgina completed her laser-shooting coaching certificate and developed and coached European and World Championship medallists. She helped coach swimming, running and the combined events of biathle, triathle and laser-run, and her enthusiasm makes shooting training fun. Georgina is a fantastic person to have around whether she is coaching, team managing or organising club members. She is at the club every Friday evening setting up the shooting range and is there at the end of the evening to take it all down again. She also helps to look after the equipment and ensure it is ready to be used the following week. Even when her daughters aren’t competing she still comes along to competitions to support and help coaches and athletes.